For the last 20 plus years we have been producing all our sheet metal right here as Security Metal Roofing. In addition to our 26 & 29 gauge sheeting we also make all of our residential & industrial trim to completely finish out your project. We operate a fabrication shop as well, where our welders produce our trusses with skill and pride. Here at Security Metal Roofing we are very proud that we make it ourselves and take satisfaction in being able to present our customers with the finest building products in a timely manner. Security Metal Roofing produces roofing and siding with CERAM-A-STAR 1050 ® Silicone Protected Coatings applied over Galvalume. Watch Cool Chemistry Video! This coating system establishes a new level of high performances for silicone protected polyester coatings. CERAM-A-STAR 1050 ® (Spec. Sheet) Colors are created from field proven combinations of proprietary copolymer resin technology and long lasting, colorfast ceramic and select inorganic pigments. The result is a long lasting finish that provides optimum resistance to degradation from ultraviolet radiation in sunlight. Security Metal Roofing has built a reputation through satisfied customers and quality products for over 10 years and will continue to provide the best service to all of our customers in the years to come. "We have done business with Security for a while now and they are the best!" "Top quality, top rate service, these guys know metal! Very knowledgeable and understanding towards customer needs! You guys rock!" Both stores have great people to deal with. I've purchased material from both. Security Metal put our roof on in 1997. Still very proud we went with the metal roof! No matter the choice, Ag or R Panel will protect your roof or building for many years to come. Security Metal Roofing offers two distnct profiles an AG & R panel. 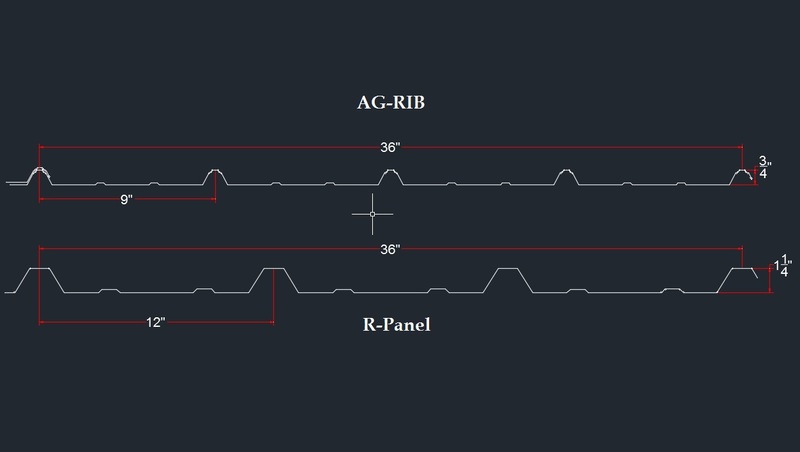 AG-Panel is a 3/4” rib on 9” centers with 36” coverage and is typicality used in residential applications. Offered in both 26 & 29 gauge. 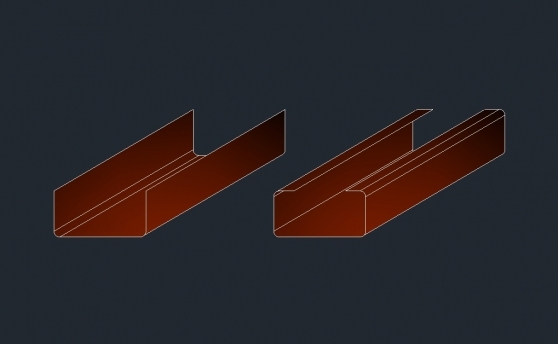 R-panel is a 1-1/4” rib on 12” centers with 36” coverage and is typicality used in industrial applications. Only offered in 26 gauge. All painted panels come with a 40 year limited warranty (Copper Metallic 35 year) and galvalume a 20 Year. Finish off your roof with trim than not only adds attractiveness but, protects as well. Security Metal Roofing has the know how and experience to make it happen. Our trim is offered in all colors no matter if its custom to your project or stock. Security Metal Roofing Makes trim in 10', 16', and 20' and we keep many profiles in stock ( no wait ) in 10'. Download our product list to get a better look. 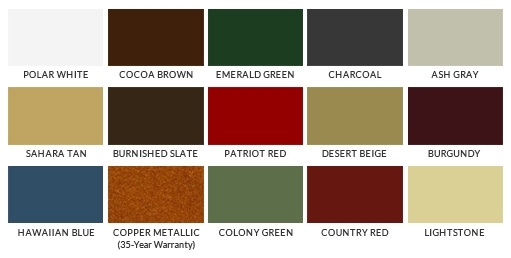 Accent your new Security Metal Roofing building in a color that will make it pop. Our Industrial and Post frame trim is offered in 10', 16', and 20' and all colors as well. Don’t know what trim you need? We can help you there, our knowledgeable sales professionals can aid you in finding the perfect piece that looks good and works! Please download our product list. 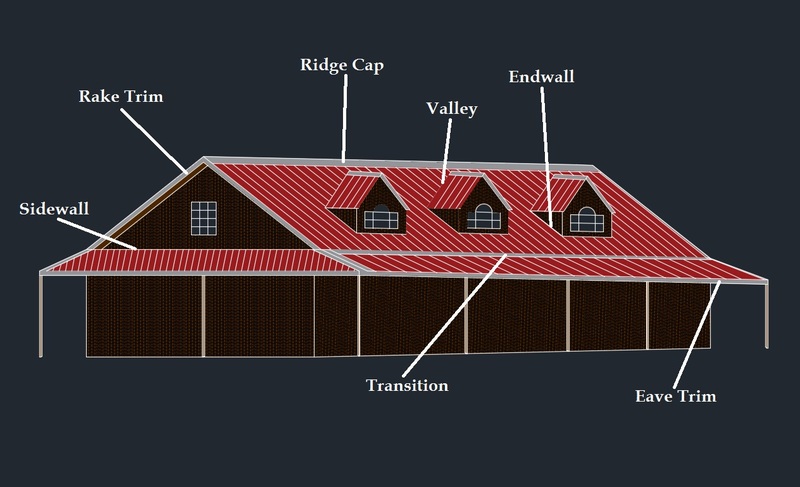 For superior strength and efficiency Security Metal Roofing offers prefabbed trusses. 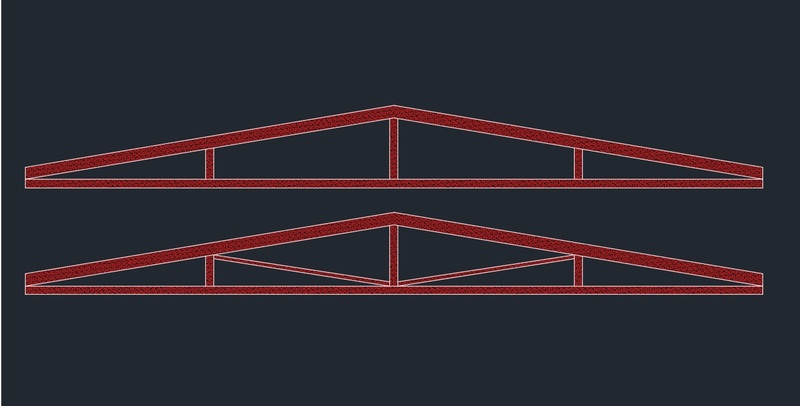 Our trusses ane designed to receive cee purling and eave struts for added speed when erecting and a stronger building when finished. We currently make trusses in 12, 15, 18, 20, 24, 30, 40, and 50' on a 2/12 pitch but, we can make trusses to your desired length and pitch. Red Iron Sourced in North America Only!!! 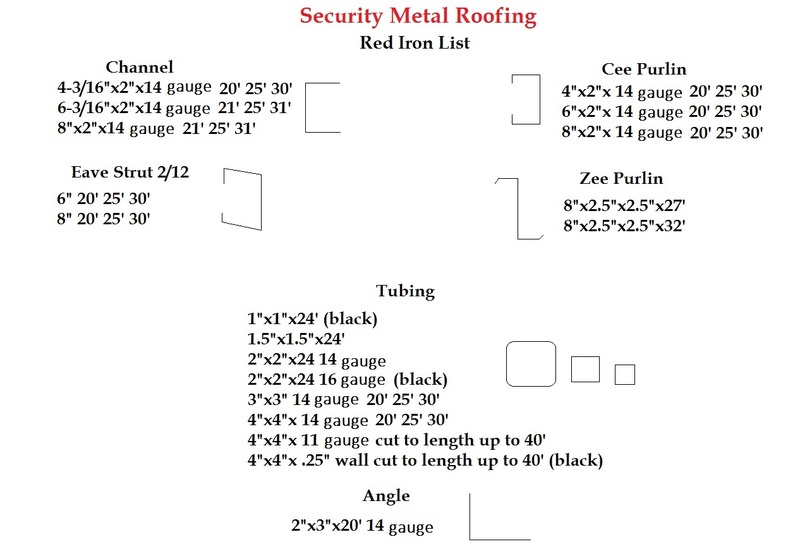 At Security Metal Roofing we have a massive inventory of red iron. We carry Cees & Channel to Tubing to Eaves & Zees, everything you need for your building project. 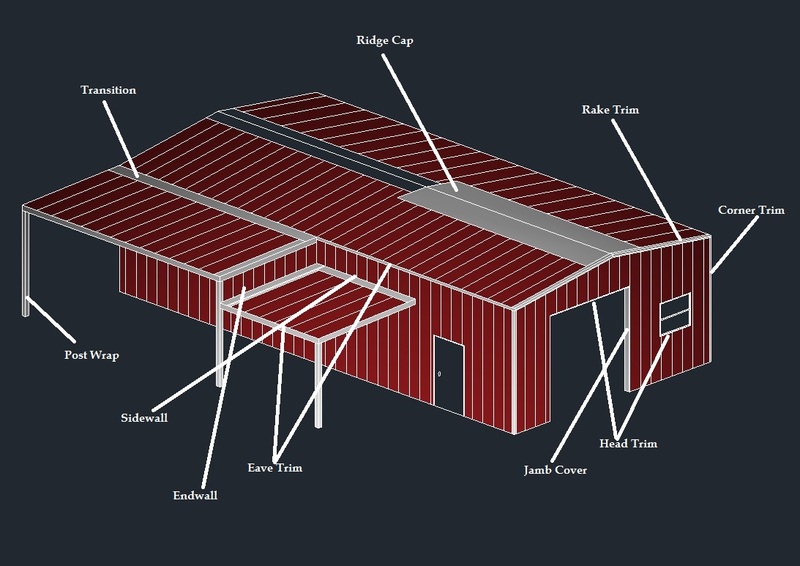 Need guidance on constructing a building? We can offer you erection drawings and the knowledge to get the job done. How does a metal roof save Energy? Most conventional roofing materials such as asphalt shingles absorb energy from the sun. This is not the case with metal which does not have the weight and bulk of shingles and therefore metal does not absorb or retain the heat from the sun’s rays. Because of this fact at day’s end a metal roof will cool down quicker as well. As a result of this the attic space remains cooler and you do not find all of the heat in your attic attempting to escape out into your living space below. Metal roofing provides a much better defense against the sun as opposed to conventional roofing materials which tend to absorb and retain heat which results in higher energy bills for you the customer. Yes. Metal is light weight and is easily installed over existing roofing materials and this is done without the disposal problems frequently associated with conventional re-roofing projects. SECURITY METAL roofing materials can be installed directly over your old conventional roofing materials. This is the absolute best time to consider a metal roof. At SECURITY METAL we have a saying, "buy your last roof first" . One of the wisest decisions you can make as a new home builder is to opt for a quality metal roof. Durable, attractive and energy saving ......a metal roof can prevent you the need to have to replace your conventional roof every 10 or 12 years. It also allows you to enjoy the money saving energy benefits on your utility bills from the first month in your new home. Realize that your contractor might attempt to talk you out of a metal roof simply because they do not have the necessary skills to install it. We will be glad to put you in contact with a skilled roofing installer. At SECURITY METAL we know that appearance is a major factor in the choice of your home's roofing materials. The homeowner will have a wide variety of styles and colors to choose from . Our colors are created from field proven combinations of proprietary copolymer resin technology and long lasting, colorfast ceramic and select inorganic pigments. The result is a long lasting finish that provides optimum resistance to degradation from ultraviolet radiation and sunlight. How much noise will it make when it rains? Modern metal roofing is often installed over plywood decking and foam insulation or an existing roof. Any noise generated by rain will be similar to that made by rain on conventional roofing materials. How about the costs when compared to a conventional roof? While the initial costs of metal is higher the costs over a lifetime are substantially lower than they are with conventional materials. Metal will provide years and years of attractive, durable and low maintenance service. At SECURITY METAL our goal is to educate you the consumer on metal products, the different systems available and choosing a skilled installer. We look forward to assisting you make a quality purchase for the best price that can be found. Regardless of where you purchase your metal building supplies make sure that you are dealing with a reputable dealer who is educated properly about the metal building industry. What is the finish or coating? ............... AKZO 1050/1050cc,Silicone Polyester, Polyester & etc. Our metal is a galvalume substrate, 80,000KSI tensile strength, AKZO 1050 /AKZO 1050cc polyester, with a 30/40 year non-prorated warranty assigned to the customer at the time of delivery. SECURITY METAL also expedites small follow up orders so that your job has as little down time as possible.